Our creator God; Who is above all of the law, passed on His ‘fasting’ for the first mankind Adam, by the Pentateuch for him to inherit Eternal Life, fortifying his stability and safety by Holy Spirit as his cure. It is the formation of the Pentateuch as well. As GOD order our Father Adam, “Do not eat this fig (the forbidden fruit); if so, you shall die,” Gen.2፡16-17, but he disobeyed his law eating the fig and committing a delinquency. Then after he was baptized and resided in Corinthians monastery for 40 days and 40 nights without any consumption and drinking for the revocation of Adam’s eating the poison that consort death upon him; so GOD spilled his blood. The initiation of spiritual life and good conduct is fasting. GOD started his salvation on Friday and made it the origination of the Gospel as well. Our savior LORD Jesus Christ was baptized in this world in Jordan, where afterwards his endeavor started with fasting; as the apostles’ have also understood, they commenced abstaining. Our Fathers made fasting the beginning of the Gospel; via which we can live with GOD’s Kingdom forever and the door to the Eternal Life was unlocked making them exemplary. However, we haven’t order them to fast while they don’t; we ought to fast and pray while living on earth with him as our savior, saving us from the predicament and ceaseless smoldering. We should devote our life to LORD Jesus Christ to feat what is permitted, abscond what is forbidden, abiding the law, for salvation by the Gospel and to heal our sore soul. A soul with courage to fast and consequently experiencing spirituality and being diffident , denying the desire of eating and drinking needed for our corporeal can be permitted as the soul’s will. If this soul attains what Christ sermons, we can bare every difficulty including imprisonment and whipping. Our abstaining to repentant our sin, not only to return back to GOD, but also to live Eternal Life and express our love by the Gospel of our savior LORD Jesus Christ. LORD Jesus Christ in Matthew’s Gospel 4:1-11 stated, during His fast, satan tormented him by greed, haughty and materialism. He defeated greed by tolerance, haughty with courteous and materialism through generosity. Nowadays, we can identify these ordeals to defeat our enemy just as LORD Christ defeated satan and throw him to Hell! In Gospel of John 16-33, Christ said, “Therefore, conquer; for I have surmount the world,” because fasting heals Leprosy of soul’s. It wipes out the desire for physical craving; satisfy soul’s starvation and enslavement from satan uniting us with LORD Christ. Alike our LORD Jesus Christ fast for our salvation; we need to follow his foot step and defeat our enemy satan for becoming heir to what our Fathers have inherited. In the spiritual life of maturity and the physical longing, fast is a sacrifice to GOD. Fast is the foundation of every good deed of the Gospel, His first order to Adam and charismatic gifts, the beginning and the end; Alpha and Omega; GOD. In Ezra 8:23, it is stated, “We fast pleading GOD; and He hears our prayer,” for us to understand that fasting is our way to commune with GOD and for prayer; we recognize that those people have comprehended it. The prophet Joel 2:12 told us, “GOD said, return back to Me with your entire heart with sorrow, fast and yelping; blow the trumpet in Zion; bless fasting, and announce the synod.” Thus, we shouldn’t ask GOD about our physical desire, what we eat, drink, for our peace and harmony. Foremost, Jesus Christ thought us through the prophets to fast and pray; for our enslavement of our problems and sorrow. The prophet Isaiah in 58፡12 informs, “The houses torn down at ancient time, will be reconstructed, its formation will pass on to the next generation and you will be known as the emissary of what is broken and renewing the path of life”. Furthermore, in verse 5 “I didn’t choose this fast, at the day like this, we shouldn’t grief and while fast makes diffident, with that GOD is faithful; there will be blessing upon earth as well; GOD will nourish him with Jacob’s bequest as He Himself stated”. It is affirmed in the apostles 13:1-2 that Barnabas and Saul were called for spiritual life by fasting and praying. On those days after their fast, prayer and their blessing with their holy hand, they escorted them out. When a person commences the path of worship, he ought to fast and pray; Like Lord Jesus Christ taught us, fast is the way of worship. To find the generation, the apostles fasted before taking apostolic pilgrimage. Subsequent to our LORD exorcising demons whom the disciples were unable too; they asked “Why couldn’t we exorcise,” and so he elucidated their lack of faith. “This generation can get salvation by praying and fasting; but none other.” Other than that, it is important to understand the improbability to exorcise. Opposing and resenting fasting, without its functionality and thinking we could expel demons; it could lead us into being despair and fools of satan. The first Sunday of the Great fast is known as ‘Zewerede’ meaning the one who descended from above. The second Sunday known as ‘Kidist’, the name signifying GOD’s holiness. The third Sunday is ‘Mikurab’; the word standing for the synagogue, reminding us that our LORD during His ministry taught in the synagogue. The fourth Sunday is ‘Metsague’; meaning the one who infirm. A hymn for the healing of the sick and giving sight to the blind by the LORD is sung on this day. The fifth Sunday is ‘Debrezeit’ a geez word standing for mount olives. A hymn of our lord’s second coming -dooms day which he taught on Mount of Olives is sung on this day. The sixth Sunday ‘Gebreher’/Good servant/, the story of the good servant who received two talents are told and sung on this day. The seventh is ‘Nikodimus’– a hymn commerating the coming to ‘Nikodimus’ to our LORD during the night is sung. The eight Sunday is ‘Hosanna’/Palm Sunday/. It is a commemorative day on which our LORD entered into the temple in triumph and during which the people sung Hosanna in the highest. Now there was a man of the Pharisees named Nicodemus, a member of the Jewish ruling council. He came to Jesus at night and said, "Rabbi, we know you are a teacher who has come from God. For no one could perform the miraculous signs you are doing if God were not with him.” He was impressed with the signs that Jesus performed in Jerusalem. Jesus answered and said to him, “Most assuredly, I say to you, unless one is born again, he cannot see the kingdom of God” Nicodemus said to Him, “How can a man be born when he is old?" Jesus answered, “Most assuredly, I say to you, unless one is born of water and the Holy Spirit, he cannot enter the kingdom of God”. This meant that God is above and therefore to enter His Kingdom we must all be born from above. What does being ‘born of water’ mean? We understand in the phrase ‘born of water’ a reference to baptism, either that of John the Baptist, or Christian baptism. The phrase describes our Christian baptism which unites us with the Holy Spirit. Through this wonderful sacrament, we become children of God. Nicodemus desired to become a child of God and was baptized. He believed in the Words of Jesus, was born from above and became one of God’s children. Why did Nicodemus come to Jesus at night? Based on our Church’s interpretation, Nicodemus chose to come to Christ during the night time for fear of being seen by the Jews; he was a scholar and member of the Jewish ruling council. The other reason was probably to get enough time to converse with the Lord and ask Him whatever questions he might have had. After our Lord Jesus Christ died on the Cross, Nicodemus got a chance to collect and bury the body of His Lord. He and Joseph had lived as secret disciples of the Lord and thus buried His body together. Before that fateful time, Judas sold the Lord for thirty pieces of silver; the chief apostle Peter denied Him and swore that he never knew Him; the other disciples too forsake Him; the chief priests accused Him of blasphemy and the council condemned Him to death. The only people who took risk of the ridicule of the Romans and persecution from the Jewish religious council for following the Lord till the end were Nicodemus and Joseph – the hidden disciples. The two men came to collect and bury the body of Jesus at their own expense. Here we witness the word Nicodemus received from Jesus in private bearing public fruit. What can we learn from Nicodemus? Nicodemus held a high position of trust in the Jewish nation. He was highly educated and possessed talents of no ordinary character, and he was an honored member of the national council. Though rich, learned, and honored, he had been strangely attracted by the humble Nazarene, our Lord Jesus. He did not talk with Christ about state affairs, though he was a ruler, but about the concerns of his own soul and its salvation. If we are to grow, like Nicodemus, we need to admit and seek Jesus for the grace to make the change. Education, culture and science may change us but only the grace of God can transform us. The word of Jesus has the power to transform and release us from every hold of egotism, pessimism, criticism and worldly mindsets. So let us not boast in our authority, wealth, knowledge, …. that God gave us. Let’s rather learn from the life of this giant saint and seek the rebirth that ushers us into eternal life. Sources: Holy Bible, King James Version. Abune Gebre Menfes Qidus [means the salve of the Holy Spirit] was born on Tahisas 29 in 829 E.C; his date of birth and conception coincided with the day of His GOD, JESUS CHRIST. His father’s name was Simeon, and his mother’s name was ‘Aklesya who were righteous before GOD. They remained childless in moan and prayer for a period of thirty years because they had not got a son. However, later God heard their prayer and gave them this child. According to his Gadl (Hagiography), the saint was appeared from the city of Nehisa, in Egypt and lived there 300 years in the desert of Egypt. Then, he came to Ethiopia by the order of God and wandered about the wildernesses of Ethiopia. He, then, departed to the land of Ziquala, that later on became the great monastery of the saint and lived there 265 years as if naked and drinking no water and eating no food, exceeding many prophets of old and unlike a man upon earth, but likened to the angels. Due to this divine order, the abbot raised him according to the Church’s rule, teaching all the scriptures and other religious learning. Later, he got ordination from the bishop called Abba Abraham and he dwelt in the Egyptian desert called ‘Gebota’ [most probably in Upper Egypt] three hundred years. The saint did not eat the bread of earth, or drink water, or wear raiment and he never prepared anything for his body, but he lived naked in the desert. However, he was arrayed by his beard and the hair of his head that covered his whole body like a thatch and swept the ground. He was like the fowls of heaven, for he thought nothing about the food of this world, but he hungered and thirsted for God; his sustenance was offered from heaven. 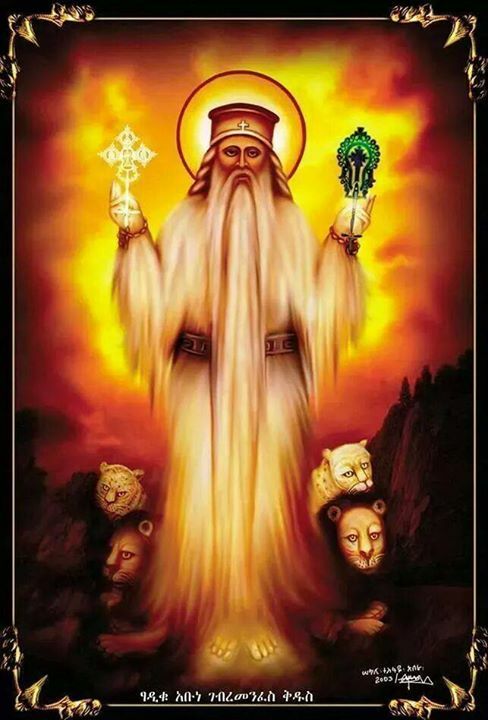 One day, the three saints (Abba Samuel of Waldebba, Abba Anbes of the land of Hazalo and Abba Benyam of the upper land of Egypt) came to the land of Kabd, carried on their lions, to ask and see Abune Gebre Menfes Qidus ’s celebrity. When they reached there they couldn’t get him and they stayed there for seven days in search of him. Then a certain lion came to the three saints and devoured their lions. Then, the saints felt bitterly sad, and their sorrow was revealed unto our father, Abune Gebre Menfes Qidus. Then after he came to them with the great power accompanied by his lions and leopards , the saint rebuked the lions, and he rose up the dead lions from the belly of the lions and sent them away to their former owners. During his combat, Satan came to him in the form of a black raven, pecked at his eyes, and dug out his eyeballs. Consequently, the saint remained blind for ninety-eight years, till the angles (Michael and Gabriel) healed his eyes through their breathing. He lived 100 years in solitude in Lake Ziquala, praying for Ethiopia and the world as well. He lived in the desert escorted by 60 lions and 60 tigers that served him. The saint lived 300 years in Egypt and 262 in Ethiopia with a total life span of 562 years on earth and died on Megabit 5 /March 13. Due to his spiritual struggle, he was entitled with these names: “the Star of the desert” and “the Head of Anchorites”. The entry of the saint from Egypt to Ethiopia; the day on which he went out from the lake where he received the covenant from God; the day on which he raised the dead lions; the first mass of his church built in his name was also celebrated on this day. His departure is commemorated on Megabit 5/March 13. Consequently his Gadl states that, he died in Ziquala and rested in Medre Kebd. May the prayer of Abune Gebre Menfes Qidus be up on us! • ገድለ ገብረ መንፈስ ቅዱስ : 1992 E.C :: (The Hagiography of Abune Gebre Menfes Kidus) 1992 E.C. • የዝቋላ ደብረ ከዋክብት አቡነ ገብረ መንፈስ ቅዱስ ገዳም ዐመታዊ መጽሔት ጥቅምት: 2007:: (Annual Journal of Ziquala Debre Kewakibt Abune Gebre Menfes Kidus, October, 2007). Saints enjoy greater grace before God for forsaking the world and receiving hardship for the love of God. They have received spiritual powers to perform miracles while in this world such as making the dead rise, healing different ailments and driving out demons. Saints intercede not only in the realms of the flesh as the scriptures testify for they are alive in soul. (Ex.32:2-15; Enoch 12:33-40, Luke 20:37-40). The word of God is living, and it works on the living. His covenant never changes and He Himself has said that saints are also living. If the Lord said this about the apostles, then how much more effective would be the prayers of the Mother of God for the salvation of her children? We have seen St. Mary receiving the motherhood of the Incarnate Son of God. This motherhood is not merely an honorable title but a responsibility of unceasing work. Being a superior member of the body of our Lord Jesus Christ, she responds to the need of the other members seeking the salvation of everyone. The story of the wedding of Cana of Galilee shows how great the intercession of Virgin Mary is. When St. Mary saw that the wine at the wedding had run out, she informed her Son, “they have no wine” (Jn 2:3). Of course the Lord was aware of that and surely he does not need to be reminded with the need of his children. But He who is full of love is pleased to see the mutual feeling of love in His mother and His children. Her request was only made once, which shows clearly her confidence in Her Son’s reply, for she did not repeat her request but with every assurance she said to the people, “Whatever He says to you, do it.” (Jn 2:5) Through her conversation with the people of the wedding, we can visualize her role in intercession. For she presents our needs to her Son and then directs our hearts to diligently carry out His comandments and to do whatever He tells us. Accordingly, the Ethiopian Orthodox Tewahido Church commemorates the covenant of St. Mary by the name Kidane Mehret. Kidane Mihret (ኪዳነ ምሕረት) is a Ge’ez phrase which literally means ‘covenant of mercy’. The phrase is used to refer to God’s promise to St. Mary that he would forgive the sins of those who seek her intercession – a fact that underscores the enormous grace of Our Lady before the Almighty. Kidane Mihret also refers to Yekatit 16 (February 23), the day on which St. Mary received the promise.It is also observed on the 16th day of each month though not as colorfully as on February 23. The day marks one of the 33 feasts of St.Mary. According to the Ethiopic Synaxarium (pp.365), God has promised St. Mary that he will bless those who celebrate her commemoration, call upon her name, or give alms to the poor even if it were only a cup of cold water. He also promised to bless those who build churches in her name, give cloth to the poor; those who visit the sick, feed the hungry, comfort the grieving, or write the history of her strife. May her prayer and intercession be with us!!! • The Ethiopian Orthodox Tewahido Church Faith, Order of Worship and Ecumenical Relations (1996: 60-62). • The book of the saints of the Ethiopian Orthodox Tewahido Church (Synaxarium). 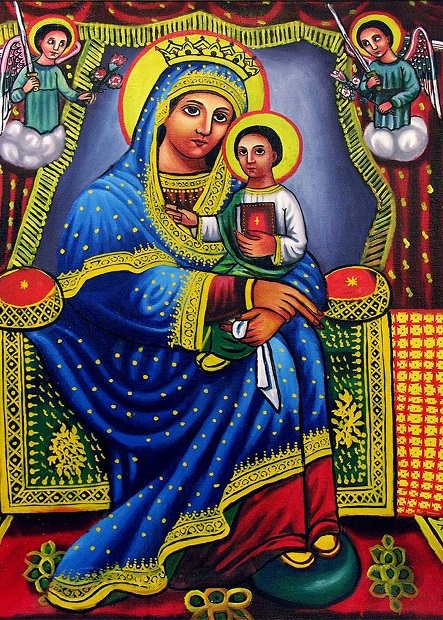 The Ethiopian Orthodox Tewahido Church celebrates the entrance of Our Lord Jesus Christ into the Temple on Yekatit 8 (February 15) carried by His mother, Saint Mary. The Ethiopian Church calls the feast, ‘Lidete Semon’ to remember the anticipation of Semon with the Holy family at the Temple. The event is described in the Gospel of Luke (Luke 2:22–40). St. Mary and Joseph took the baby Jesus to the Temple in Jerusalem forty days after His birth to complete the ritual purification after childbirth, and to perform the redemption of the firstborn son, in obedience to the Law of Moses (Leviticus 12, Exodus 13:12–15, etc.). Upon bringing Jesus into the temple, they encountered Simeon, an old man who had been promised that "he should not see death before he had seen the Lord’s Christ" (Luke 2:26). According to church manuscripts, Simeon was one of the 70 scholars who were chosen by a king called Betlimos (Ptolemy II ) to translate and interpret the book of the prophets from Hebrew to Greek (Tsir’e). The translation of the Hebrew Bible into the Greek language is known as the Septuagint (the LXX). The name “Septuagint” comes from the Latin word for seventy. Simeon was in charge of translating the book of Isaiah. As he reached the sentence that read, “behold the Virgin becomes pregnant and gives birth” (Isa. 7:14), he was confused by the discrepancy as women cannot be virgin and pregnant at the same time except St Mary. As he feared that a direct translation of the text will cast a shadow of doubt over his translation skills and he could face punishment due to that, he replaced the word ‘virgin’ with ‘woman’. But after a while he witnessed a miracle: the word ‘woman’ was replaced by ‘virgin’. He erased that and wrote ‘woman’ instead of ‘virgin’. But the word was erased again miraculously. Then an angel came to him, told him not to erase the word ‘virgin’ and said, “you shall not see death before you see the Lord’s Christ (whom the Virgin gave birth to)" (Luke 2:26). Simeon lived for 500 years was bed ridden. But when he met the Holy Family at the temple and carried the Child Jesus Christ, he regained his strength and was full of energy like a young man. 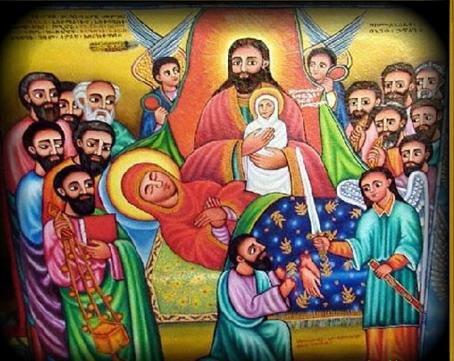 That is why the Ethiopian Orthodox Church celebrates the day and named it ‘Lidete Simeon’ (Birth of Simeon). At that time, Simeon offered a prayer which came to be known as the prayer of Simeon, or Canticle of Simeon, which prophesied the redemption of the world by Jesus: “Lord, now lettest Thou Thy servant departs in peace; according to Thy word: for mine eyes have seen Thy salvation, which Thou hast prepared before the face of all people: to be a light to lighten the gentiles and to be the glory of Thy people Israel.” (Luke 2:29–32). Simeon then said to Mary: "Behold, this child is set for the falling and the rising of many in Israel, and for a sign which is spoken against. Yes, a sword will pierce through your own soul, that the thoughts of many hearts may be revealed" (Luke 2:34–35). • ወንጌል ቅዱስ ዘእግዚእነ ወመድኃኒነ ኤየሱስ ክርስቶስ ዘዜነዉ ማቴዎስ ወማርቆስ ሉቃስ ወዮሐንስ::( The four Gospels commentary), written and interpreted by Ethiopian Orthodox Tewahido Church scholars, 19 88 Eth.Ca, pp. 382. • Ethiopic Synaxarium on February 16. The fast of Nineveh is a three-day lent recognized by the Orthodox Tewahedo Church, which lasts from Monday to Wednesday, two weeks before the beginning of the Great Lent. This year’s Fast of Nineveh begins on Monday, February 6 and ends February 8. The dates of this fast vary every year according to the date of Easter. It rotates within 35 days of variance between Tir 17 (January 25) of lower limit and Yekatit 21 (February 29) of upper limit). The Fast of Nineveh is ritualistically similar to the Fast of the Great Lent. As with all other fasts of the Holy church, the fast of Nineveh is observed by refraining from the intake of all dairy and meat products. During this fast, we remember the three days Prophet Jonah spent in the belly of a large fish as penance for his disobedience to God and the atonement of the sinful city of Nineveh. This fast teaches us how a sinner can inherit the kingdom of God through repentance and realized God’s love and concern not just for His own people. During these three days, we should look at our lives and show remorse for our disobedient natures and follow in the footsteps of Prophet Jonah and the people of Nineveh. This fast is about getting rid of our bad habits, just like the mariners threw most of their cargo that was in the ship into the sea, to lighten the load and to make the ship sail safe. This fast is about to cast off our worldly desires and cultivating virtues. Just as the captain awakened Jonah from his sleep, let us also awaken ourselves from spiritual sleep and call upon God during this three-day Fast. Note: As the fast of Nineveh is the herald of the Great Lent, the Great Lent (55 days of fast) will begin on Monday, February 21. A blessed fast to all of you! celebrated across Ethiopia. It coincides with the season the church devoted to celebrate the different manifestations of Christ’s glory and Divinity, especially the Nativity, the Baptism as well as the miracle at Cana. The term ‘Aster’eyo’ is more related to the commemoration of the death of St. Mary in view of the fact that God came with thousands of His angles to comfort her, as is recorded in the Synaxarium. The years of St. Mary’s life on earth were 64 years. She grew up in her parents’ house and lived there for 3 years and 7 months. She was then given to the priests in the temple to grow there serving in God’s house. She left the temple when she reached the age of 15. She spent 34 years and three months in Joseph’s house until the Ascension of the Lord, and spent the rest of her life (i.e. 14 years) with St. John the Evangelist, according to what the Lord said when He was on the cross: "Behold, this is your son," and to St. John, "Behold, this is your mother." Source: Synaxarium – The Book of the Saints of the Ethiopian Orthodox Tewahedo Church. with processions of priests carrying replicas of the Ark of Covenant, locally known as ‘Tabot’, escorted by thousands of believers. The day is observed in commemoration of Christ’s baptism in the Jordan River. 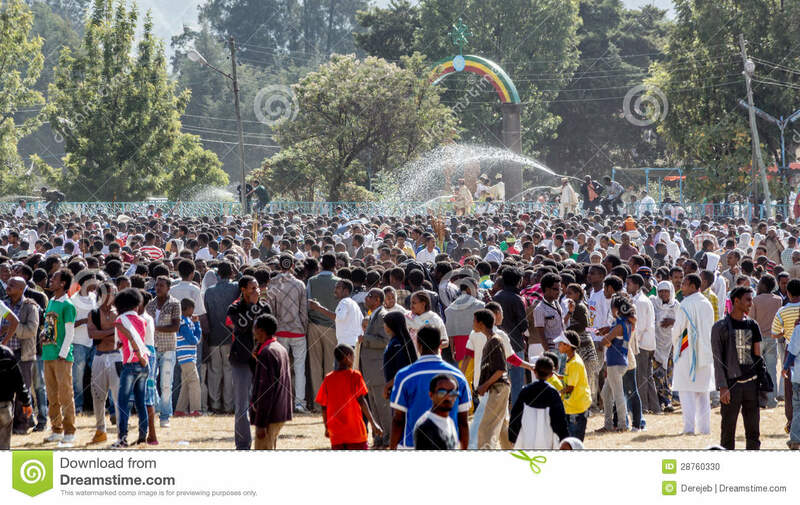 Timket is not only one of the major feasts of the Ethiopian church but it is also a public holiday when offices and schools across the country are closed. The festive lasts two days, the 18th (the eve of Timket) and the 19th 0f January, even extending to a third day where there is Tabots dedicated to Archangel Michael whereby celebrated the feast of the miracle of Jesus at the wedding of Cana. Though Timket is celebrated on January 19, the season, according to the church’s tradition, covers the period from the eve of the festival to the start of the three-day fast observed in commemoration of the fast the people of Nineveh observed to avert God’s wrath. The eve of Timket is known by the two major events: Ketera and Gehad. Following those traditions, the Tabots are taken to rivers and pools early afternoon on the eve of Timket, which is known as “Ketera” meaning ‘making a reservoir for the celebration’. Each Tabot is carried overhead by a high priest to the nearby body of water accompanied by thousands of church members chanting hymns. The celebration is also augmented by spiritual dancing (known as Shibsheba), drum beating, horn blowing, prayer stick waving and sistra rattling. Alula Pankhurst (2010) state that the eve of Timket is known as Ketera, a reference to damming a stream to make a baptismal pool, known as Timkete Bahir. He recounted quoting from early literature that James Bruce, the 18th century Scottish traveler, describes how the streams are in Adwa was dammed for several days to reach a depth of four feet. 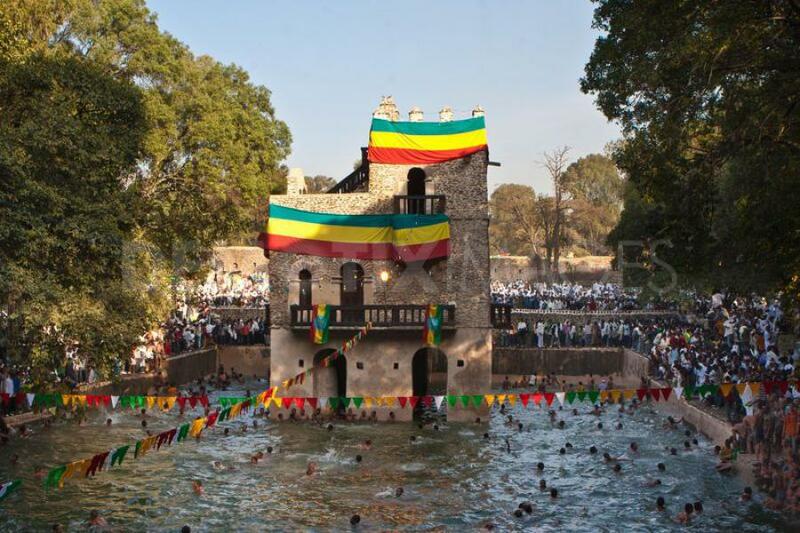 In some cities pools were purpose – built, the most famous being Fasiledes’s pool at Gondar and the queen of Sheba’s at Aksum. The 16th century Portuguese writer Francisco Alvares describes how water was diverted at Emperor Lebne Dengil’s court through an intricate system of channels and pipes and filtered through cloth. The celebrations begin with a procession leaving each church in the early afternoon after a service and a prayer which is known as Wazema have been performed as it has been done during other major church holidays. The eve of Timket is also locally known as Gehad, meaning ‘manifestation’ in relation to the appearance of Jesus Christ. It is a one day fast assuming that if the feast of the two great holidays – Christmas and Epiphany falls on Wednesday and Friday, the laity shall fast the days before epiphany in replacement of the fast of Wednesday and Friday to celebrate these great feasts in joy and happiness. If the eve of Epiphany falls on Saturday and Sunday, one can consume early in the morning but only prohibited from dairy products. Priests and devout Orthodox Christians do not taste any food or water until the Tabots installed in their temporary tents around sunset. Throughout the night sermons in relation to the Baptismal of Jesus, singing, dancing and praying to continue. The Kiddase (Divine Liturgy) is administered near the pools early in the morning. Passages from the story of the Baptism of Jesus Christ recited from the four Gospels at the cardinal points of the pool. The Patriarch (head priest) dips his cross to bless the water. Three candles are floated on a water of wood in the baptismal pool, symbolizing the Holy Trinity. The water is then blessed and sprinkled towards the assembled congregation, some of whom immerse themselves in the water, symbolically renewing their baptismal vows. However, the festival does not end at a baptismal pool on the afternoon of January 19; the crowd escorts the return journey of Tabots, which circle their respective church before entering the Mekdes, the Holy of Holies. Only the Tabots of St Michael remains a further night there, since its feast is on the following day, associated with the first miracle of Jesus, the Wedding of Cana. Though Timket is a religious festival, many ethnic groups in Ethiopia celebrate it in line with their cultures. This adds to the appeal of the festival for foreign visitors and makes it one of the national celebrations which attract many tourists to Ethiopia. 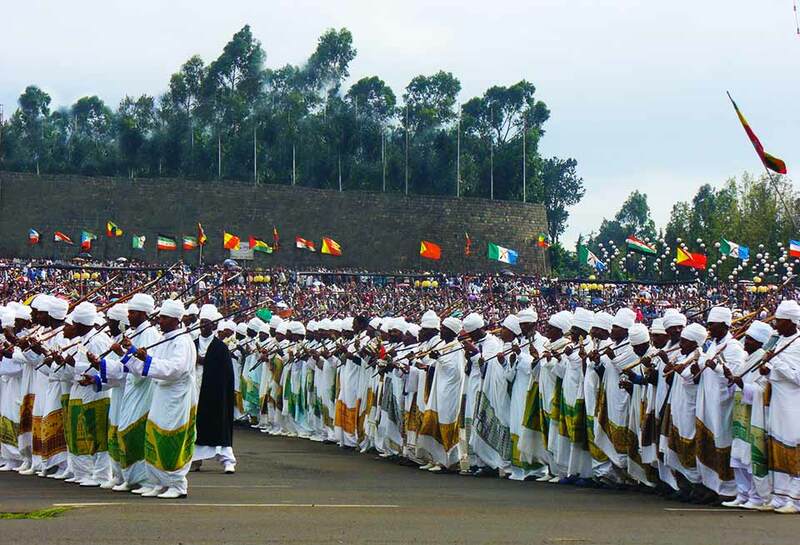 Currently, there has been a campaign to record this culturally deep-rooted Ethiopian holiday in UNESCO’s intangible world heritage list next to Meskel (True Cross) celebrations. • Megabe Mstir Welde Rufael Fetahi and Kesis Samuel Eshetu, 2014 (tra. Dr. Merkeb Mekuria), Betimketu Dagmenga Weleden, pp.132, (Special publication by the Ethiopian Orthodox Tewahido Church, Addis Ababa: Tinsae Zegubae). • Alula Pankhurst, (January – March 2010). 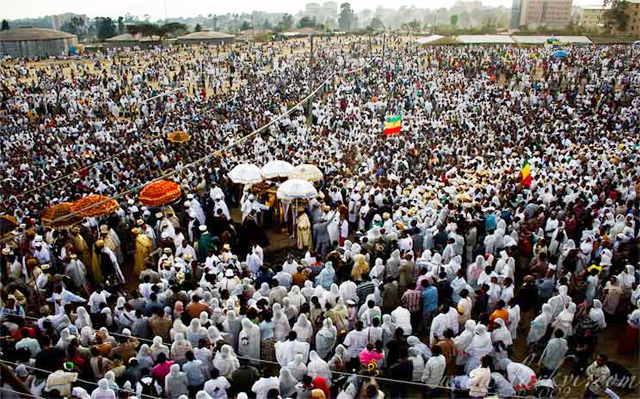 The Festival of Timket in ‘Selamta Journal’ – the In – flight Magazine of Ethiopian Airlines, Volume 27, Number 1, Pp. 34-36.